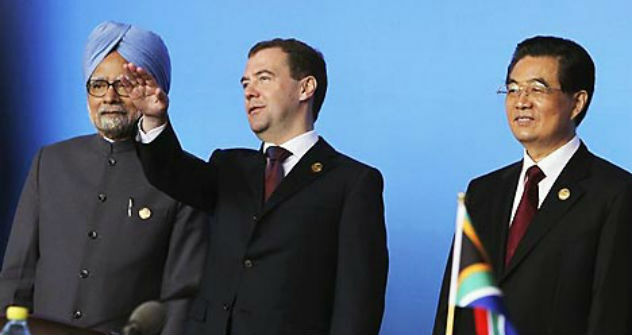 Moscow counts on strengthening of BRICS positions in the world. Moscow counts on the strengthening of the positions of BRICS (Brazil, Russia, India, China, and South Africa) association of countries in the world and on its positive impact on world problems. Russian President Dmitry Medvedev, who arrived in the Indian capital on Tuesday night, will present his vision of these matters at the fourth summit of the Association here on Wednesday. Presidential aide Sergei Prikhodko told Itar-Tass: "Russia expects that the forthcoming summit will make decisions that will exert a tangible positive influence on the development of the financial, economic, international and political situation, strengthen BRICS positions in the world and advance interaction in various fields". Prikhodko said Russia's priorities at the summit are "to deepen the analysis of the state of affairs in the world economy and finances, as well as coordinate the positions of BRICS countries in the run-up to a G-20 summit in Mexico in June". He said Moscow is also interested in a "reform of the International Monetary Fund (IMF) and a discussion of the scope of and conditions for a possible participation by BRICS in replenishment of the IMF financial resources; a 'comparison of positions' on the most acute international and political issues (the situation in Syria and around it, and the situation around Iran); and energy safety problems". Prikhodko said two sets of matters are brought up for discussion under India's presidency. The first set concerns global management problems. "The leaders are to exchange views on the state of the world economy, reforms of global mangement institutions and the problems of international stability and security," the Kremlin official pointed out. BRICS and sustainable development is the other aspect of discussions." "In this respect, the leaders are to discuss India's idea of establising a South-South Development Bank, as well as of preparing for UN conferences on sustainable development and on biodiversity, which are to be held in Brazil this year; the attainment of the Millennium Development Goals, and prospects for the Doha round of talks within the framework of the World Trade Organizaation," Prikhodko pointed out. He said a Delhi Declaration will be made public as a result of the leaders' meeting. "The Declaration is confirmed, not signed. The document is compiled only in English," the presidential aide specified. The Kremlin official pointed out that BRICS does not mean only annual summits and that work is being also done at the level of Cabinet ministers and representatives of the sides.